Stethoscopes and white coats aren’t the only must-have tools for modern physicians. Smartphones are becoming just as prevalent, and just as important. As doctors and other healthcare professionals bounce from patient room to patient room, or from hospital to hospital, they need mobile-first healthcare solutions for clinical communications, real-time electronic health record (EHR) access and workflow productivity. Of course, not all smartphones are created equal, especially for highly regulated and ever-evolving industries like healthcare. The next-gen Samsung Galaxy S10 delivers the mobile productivity, performance and security features necessary to keep data safe and keep clinicians up to speed. So what makes the Galaxy S10 the ultimate smartphone for modern medical professionals? The Galaxy S10 range comes in three screen sizes — 5.8-in. for the S10e, 6.1-in. for the S10 and 6.4-in. for the S10+ — but even the smaller models show more than before, thanks to the high-resolution Infinity display and top-to-bottom screen. The extra screen real estate makes it easier for clinicians to edit medical records on the go, multitask across apps, and share lab results and images with colleagues. It’s also easier on the eyes for medical professionals who are working long shifts. And with Quad HD+ resolution on the S10 and S10+, physicians get high-quality images they can view up close on the go. Battery life is a top concern for physicians who constantly use their devices for communicating, viewing EHRs and updating procedure logs. A dead battery can cause a serious interruption and negatively impact the patient experience, or worse — patient care. The Galaxy S10 range not only ups the ante in terms of battery capacity, it features Samsung’s most intelligent battery yet. Designed to work longer by better managing power usage, the device tracks user habits to determine when they need battery life most. When the battery is running low and the device is not in use, it automatically closes unnecessary apps and deactivates power-hungry features. Healthcare workers don’t have time to waste waiting on apps to open. For physicians who use the same phone for their practice, hospital consults and personal communication, limited storage on a device can also pose a problem. One of the most powerful smartphones ever released, the new Galaxy S10+ comes with a choice of 8GB or 12GB of RAM. Physicians can open apps quickly and run multiple hospital apps at once without slowing down the phone. All the S10 models come with a standard 128GB of storage, with options for more onboard storage all the way up to 1TB. There’s also a microSD slot for expansion. With all that processing power and storage available, doctors have a computing device that outstrips most PCs. Take this quick assessment to evaluate your hospital's technology use and get personalized advice. The Galaxy S10 can do everything a computer can, but sometimes a larger screen and keyboard come in handy — for example, when clinicians need to do extensive charting or enlarge images to show patients. Samsung DeX lets clinicians connect the S10 to a monitor, keyboard and mouse to provide a desktop computing experience without the computer. Instead, clinics and hospitals can install DeX-ready workstations in patient rooms and at nurses’ stations. Then physicians and staff simply connect their smartphones to the monitor via an HDMI adapter to use apps with a keyboard and mouse, sharing images with patients on the large screen. With DeX, a clinic or ward can eliminate most desktops and laptops and run everything through smartphones. VDI endpoints like thin clients and zero clients have become a popular solution for healthcare providers because they are cost effective and easy to manage for IT. Physicians and nurses can log in to their virtual desktop on shared thin clients, accessing patient records and files from anywhere — whether they’re at a nursing station or back at the office. 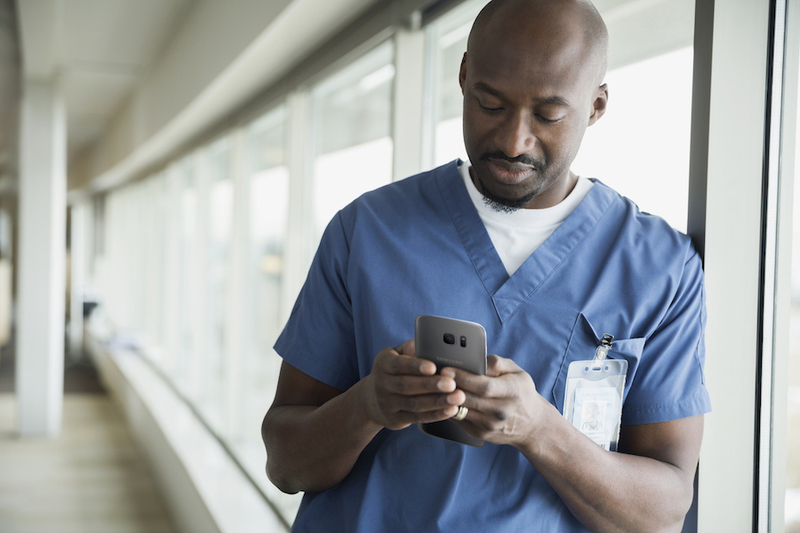 With the Galaxy S10 and Samsung DeX, healthcare providers can cut out the thin client entirely by using a VDI app on their phone. Clinicians simply dock their phones and launch Citrix, VMware or their hospital’s preferred VDI client, and they can access their virtual desktop seamlessly on the monitor. Imagine this: A doctor arrives at a hospital. Her phone immediately connects to the hospital’s Wi-Fi, opens her clinical communication, scheduling and VDI apps, and turns on vibrate mode. She is all set for a busy day. After her shift, as she get into her car, it automatically turns off Wi-Fi, connects to the vehicle’s Bluetooth, launches her favorite music streaming service and switches on “do not disturb” (someone else is on call). Bixby Routines makes this possible. This feature is new on the S10 and is powered by Samsung’s intelligent interface, Bixby. Users can create custom routines, and Bixby will suggest more based on behavioral patterns. Data security is critical in any industry, but the stakes are particularly high in healthcare, where patient data management practices must meet Health Insurance Portability and Accountability Act (HIPAA) requirements. Lost, stolen or hacked devices can lead to costly data breaches for employers and damage clinicians’ reputations, if not cost them their licenses. Like other Samsung Galaxy smartphones, the S10 is inherently secured by Samsung Knox — a defense-grade mobile platform that protects devices from the chip up, including hardware, OS and application layers. Added security doesn’t have to mean added hassle for busy healthcare workers. Entering a PIN or password every time you unlock your device only slows down patient care. Introduced on the Galaxy S10, Ultrasonic Fingerprint ID uses imperceptible sound waves to create a 3D image of your fingertip. This new biometrics technology is much harder to fool than optical fingerprint sensors since it doesn’t just map the surface pattern of the fingertip, but also the exact notches and contours. And because the sensor is embedded within the display, it maximizes security without reducing screen space. The gold standard for mobile security is for hospitals to purchase, issue, secure and manage devices — and for users to keep personal content on personal devices. But that’s not always practical, especially for physicians who work at multiple locations and only want to carry one phone. Secure Folder enables S10-wielding healthcare professionals to separate work and personal content on the device, so they can maintain HIPAA compliance while using the same device at multiple hospitals and for personal use. Data and apps in Secure Folder are encrypted using enterprise-grade Samsung Knox security architecture, and can be protected with a (user-dictated) combination of password, PIN, patterns and/or biometrics. Getting a new smartphone is exciting, but migrating data usually takes so long and is so error-prone that switching might seem like more trouble than it’s worth for a busy physician. That’s not a problem with the Galaxy S10. Thanks to Samsung Smart Switch, users can seamlessly transfer their contacts, photos, messages, apps and even device settings from their old phone to the new Galaxy phone via USB cable, Wi-Fi or computer. You can make the switch between shifts and be up and running in all your locations without missing a beat. For the fast-paced, security-centric needs of the modern healthcare professional, the Galaxy S10 simply can’t be topped. Get your free, comprehensive guide to creating a modern, mobile-first hospital.